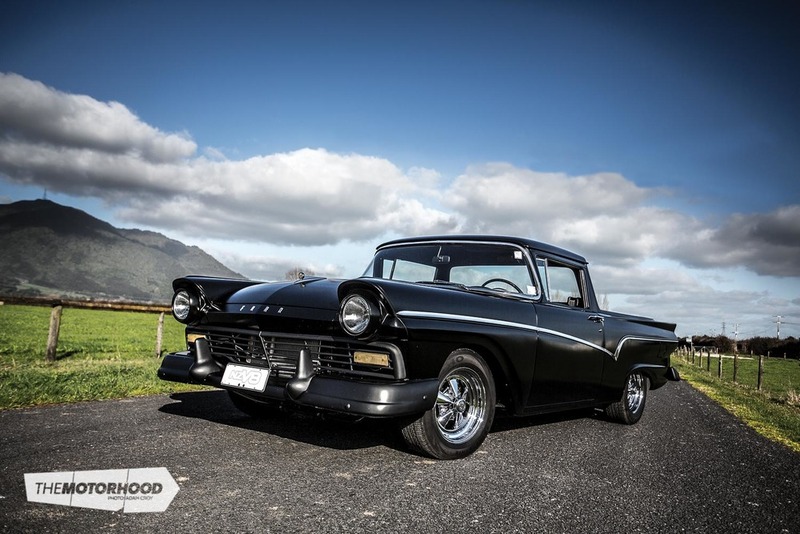 Steve Foulds has always been a fan of ’57 and ’58 Fords, and, looking at them, it’s easy to see why. 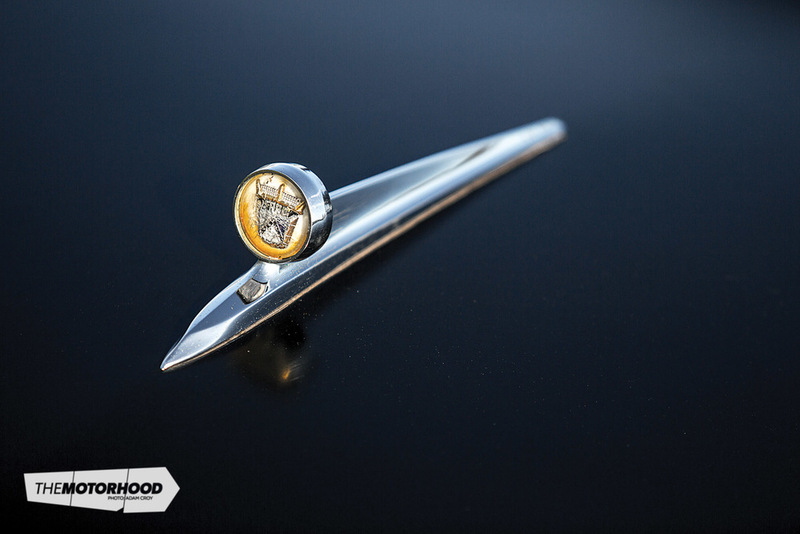 Like all other American cars from that era, the cars exude extravagance and have far more curves and detail than you’ll find on anything produced this millennium. 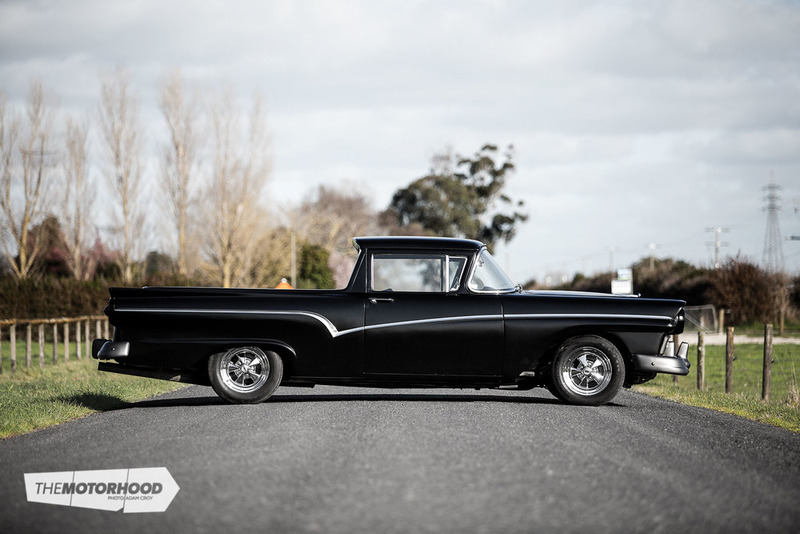 Having owned and modified various other cars over the years yet never having fully rebuilt one from the ground up, when a pile of parts vaguely resembling a ’58 Ranchero came up for sale on Trade Me, Steve knew it was the perfect opportunity. His plan at the time was just to hack something together that he could use to shuttle his dogs around in, but as soon as he set about cutting the rusted floor out of it, he knew it was going to need a whole lot more work than he’d hoped. However, unlike some car owners, he wasn’t all that upset about it; instead, he rolled with it but knew it was never going to be the dog wagon he’d originally intended it to be. Thankfully, he also knew that if he were to repair the bodywork, it would need to be done right, and that this would mean plenty of replacement sheet metal. Most of the new metal was supplied by Ford parts guru Tony Thake at Northwestern Ford, while anything not included in Steve’s bulk purchase was fabricated locally by Allan Swan. Allan also had the job of grafting the new to the old — and, with there being more new sheet metal than old, that was no small task. The work was done with the body taken off the chassis and fitted to a rotisserie, as, not only did it include the parts you’d think would be affected by rust but also those you’d never expect. In fact, the seller felt so bad about selling the Ranchero to him without knowing the true extent of the cancer, that, when he holidayed in America, the seller purchased parts to donate to Steve. While the countless hours of panel work were taking place, Steve took advantage of the easy access this gave him to the chassis and set about bringing it up to the same standard. His neighbour and good friend — and fellow NZV8 feature-car owner — Larry Kerridge stepped in to offer plenty of help and advice. Part of the reason behind the chassis rebuild — apart from aesthetics — was the change in engine plan. The original idea had been to run a small block Ford that had been sitting in Steve’s shed, but, with the body being rebuilt to perfection, it was decided that that wouldn’t do it justice. Instead, Steve set his heart on a big block. Of course, for that, he knew he would need to stiffen up the front end to suit. While the rear suspension was left stock, a set of lowered heavy-duty springs found their way up front along with a custom sway bar. Again, Tony Thake was called upon to supply parts — this time, bushes, steering, and suspension joints — while PG Hydraulics was tasked with rebuilding the steering set-up. While making his various trips from Waikato to Auckland with parts, Tony dropped the diff off to Lee at Diffs R Us, not only to get it rebuilt with a 2.75:1 final drive ratio but also to have EB Falcon discs and calipers grafted onto it. 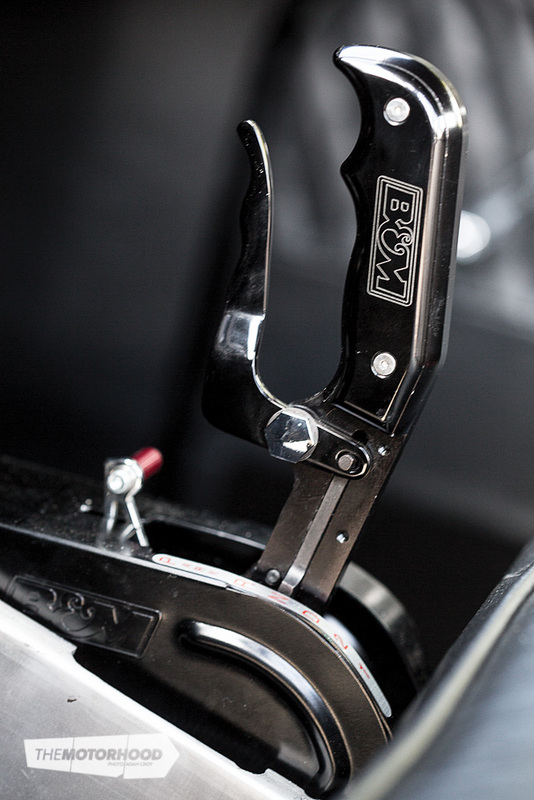 To balance out the brakes, a pair of GM calipers was fitted up front to clamp onto Mustang rotors. The more complex part of the operation, though, was the installation of the twin remote-mounted brake boosters, which are hidden under the front of the tray. These are fed instructions from a front-mounted Wilwood master cylinder. Due to the sheer size of the big block up front, a traditional booster set-up wouldn’t fit, and, being more inclined to make something work himself than spend up on an expensive solution, Steve dreamed up the twin booster system. As can be expected, the combination of a man of Steve’s talent and Larry’s input has produced a system that works superbly. Speaking of that 460ci big block engine, Steve had Barrie Richards of Barrie Richards Auto Repairs in Thames piece it together for him. The plan was never for outright power — partially due to the fact teve’d never be able to compete with Larry and partially just because it simply didn’t need it. Instead, it’s been built tough but not over the top, wearing a set of forged pistons atop the stock rods and crank. A reground flat tappet cam now sports 0.541-inch lift to make the stock high-compression heads breathe better. 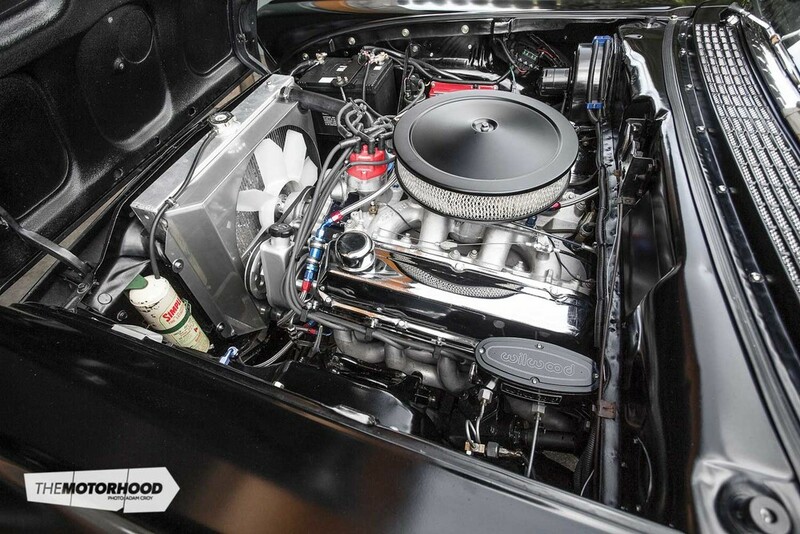 Speaking of which, Peter at Custom Chambers was asked to come on board to create a set of two-inch custom headers, which feed into a twin three-inch exhaust system. When it came to sorting the cooling, there was no need for another trip north. Monteith and Parker in Hamilton constructed the custom alloy radiator, while, even closer to home, Piako Stainless & Alloy Specialists Ltd created a stainless fan shroud. So far, the system has performed flawlessly, as has the Chuck Mann–built C6 transmission hanging off the back of the engine. Larry was called in once again to help out with this, creating a custom cross member to help secure it. Safe in the knowledge that the dogs were going to be kept far away from the interior, Steve knew he could go all out with sorting it. The task of stitching up the leather that now covers the stock bench seat was given to DR Trim in Morrinsville, which also took care of the impressive custom door trims. Steve himself fitted and wired the custom gauges as well as fabricated the custom floor-shifter mount that completes the interior. 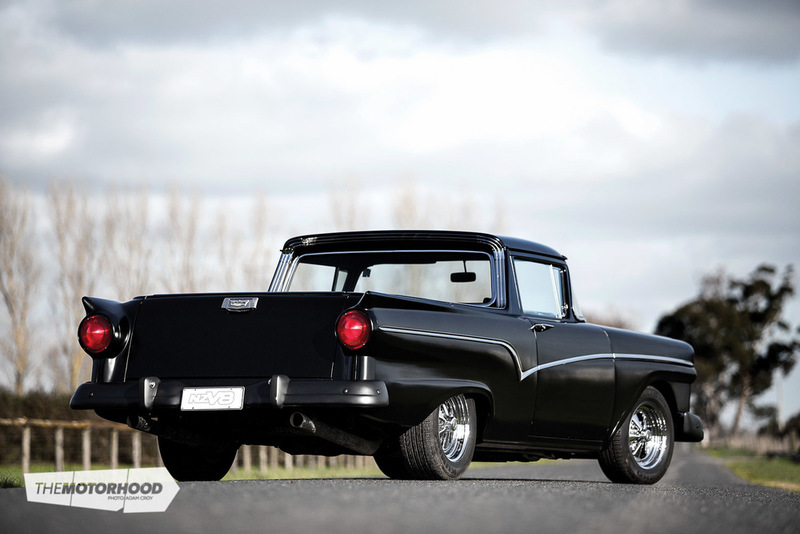 Some six years after its initial purchase, the Ranchero has only recently hit the road finished and legal. Sure, it may have been painted matte black by friend Craig Thompson, as originally intended, and it may also wear the same Cragar wheels, but, apart from that, there’s little left of Steve’s initial plan. Would he change it if he could do it all over again? “Not at all. I wanted a ’57 or ’58 Ford and always dreamed of doing a ground-up rebuild. Now I’ve got exactly what I wanted,” he says, and that’s an answer that can’t be argued with!